Designed for all 68mm bottom bracket bike, which is the commonest type bike frame. Unlike conventional hub motor and side mounted kits, the centre of gravity of mid drive kits are low and right in the middle of the frame. Thus, you can handle the bike comfortably and easily. Light weight: the freewheel crank system is made by alluminium alloy and the mounting bracket is simple and clean. Thus you will only add extra 2-3kg to your bike normally after replacing the old crank set and bottom bracket. 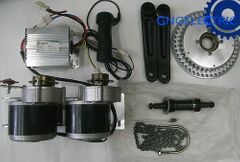 Why GNGelectric mid drive kits? Replacement parts can be supplied. Professionals help you to solve problem on installing the kits. First stage mid drive kits are installed right behind the bottom bracket and drive the original chain. Which makes it less observable. This kit includes two 48V450W brushed motor.